The car of the future is connected. It uses up-to-the-minute information from the internet to get vehicle occupants to their destination even more safely, efficiently, and conveniently. This integration into the internet of things also unlocks a host of vehicle-related services. “Connectivity is clearly revolutionizing the way we drive,” says Dr. Dirk Hoheisel, the Bosch board of management member responsible for this area. “Bosch delivers the necessary hardware and software, and is developing a range of attractive services.” The company’s strategy is opening up business opportunities as well. This is borne out by existing studies on the internet of things, all of which indicate that there is enormous market potential in the mobility sector. Hoheisel goes on to note that “the number of services in particular will rise considerably.” Thanks to its comprehensive systems expertise and product portfolio, Bosch is already in a solid position to tap that potential. The technology company addresses all levels of the IoT with its sensors, IoT software, and a diverse range of services. And this is true not just of Bosch’s mobility business, but of all the company’s other business sectors as well. A few weeks ago, Bosch premiered a cloud-based alert that warns drivers within ten seconds if there is a wrong-way driver approaching. The warning system, which is scheduled to go into production in 2016, is a connected lifesaver in the true sense of the word. As early as 2012, Bosch began operating an enhanced eCall service and a mobile information service on behalf of several automakers. The service provides accident assistance and also lends support on all other issues. And finally, several fleet operators are already using a connected fleet management solution that Bosch launched in 2014. 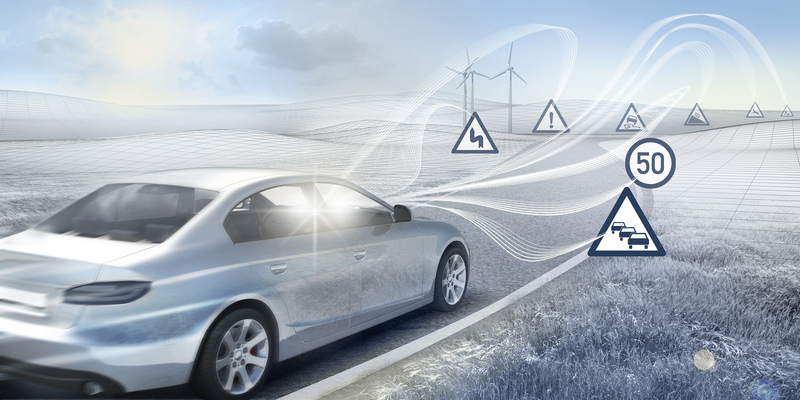 To connect the car with the internet, Bosch pursues two main approaches. First, it makes full use of the driver’s smartphone. Using the integrated mySPIN solution, drivers can link their Android and iOS devices to the vehicle’s infotainment system. 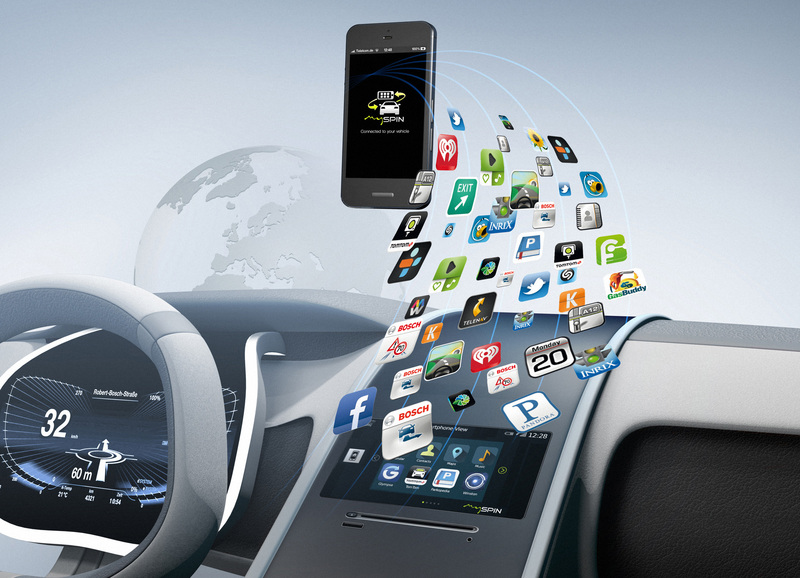 Selected apps can then be conveniently operated from the vehicle’s central display. This technology has been featured in Jaguar and Land Rover models since 2014. Use of it in Asia is spreading, driven by contracts with two other automakers in China plus an alliance with the Chinese internet company Tencent. 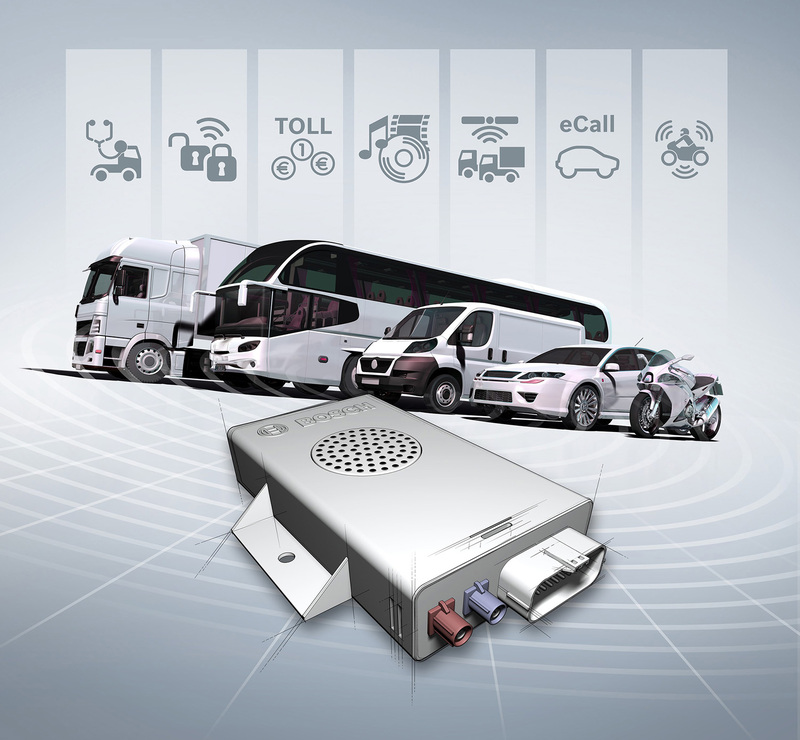 Bosch’s second approach constitutes equipping the vehicle with connectivity hardware in the form of a connectivity control unit, or CCU. The CCU receives and transmits information using a wireless module equipped with a SIM card. It can also determine the vehicle’s position using GPS if desired. Bosch offers devices specifically adapted to cars, commercial vehicles, motorcycles, off-highway vehicles, and even railway freight cars. Just a few weeks ago, for example, Bosch won a contract to optimize the logistics processes of the Swiss rail freight operator SBB Cargo. Connected to the vehicle’s electrical system via the OBD interface, the CCU is available both as original equipment and as a retrofit solution. This makes it possible for fleet operators to retrofit their existing vehicles as well. The Bosch subsidiary Mobility Media also markets this solution for private users under the name Drivelog Connect. A smartphone connected to the CCU can display vehicle data, offer tips on fuel-efficient driving, and, in the event of a breakdown, immediately contact a towing service and the garage if required. Information on traffic jams, black ice, and wrong-way drivers is available in the cloud. When combined with infrastructure data from parking garages and charge spots, this provides a broader perspective – the “connected horizon”. As Hoheisel puts it: “In the connected vehicle, the driver can see over the top of the next hill, around the next bend, and beyond.” Because future cars will warn drivers in plenty of time about sudden fog or about a line of cars stopped behind the next bend, driving will be safer. Connectivity also enhances vehicle efficiency. For example, precise data about traffic jams and the road ahead makes it possible to optimize charging management in hybrid and electric vehicles along the selected route. And because the car thinks ahead, the diesel particulate filter can be regenerated just before the car exits the freeway, and not in the subsequent stop-and-go traffic. Connectivity improves convenience as well, as it is a prerequisite for automated driving. It is the only way to provide unhurried braking in advance of construction zones, traffic jams, and accident scenes. Along with driving data and information on the vehicle’s surroundings, the connected car also captures data on the operation of individual components. Running this data through sophisticated algorithms permits preventive diagnostics. For example, the data collected from an injection nozzle can be put through distributed algorithms in the cloud and in the vehicle in order to predict the part’s remaining service life. The driver or fleet operator can be notified immediately and an appointment made with the workshop in good time. In this way, it is often possible to avoid expensive repair and down times, especially for large commercial vehicles. Yet connectivity doesn’t stop at the entrance to the repair shop. Mechanics can use transmitted vehicle data to price spare parts and labor much more quickly. In the future, their repairs will benefit from Bosch augmented reality solutions, which use a tablet computer to provide a sort of X-ray vision. When a mechanic takes the tablet and holds it under the hood, for example, the tablet’s camera image is overlaid with comprehensive additional information and repair instructions for precisely the area being displayed. The mechanic can manipulate the overlaid objects via the touchscreen and call up additional information. This makes poring through service handbooks a thing of the past. A Bosch server provides all the detailed data online.